* Free Shipping Australia Wide in 7 days. Free Shipping Australia Wide within 7 working days.If a quicker delivery is required or you have any questions please call 1800 822 681. Delivery is to your front door only. If you require additional delivery service, please specify in the Order. Note – special notes for delivery comment box at Checkout and we will contact you to advise if any additional payment is required. From the time you receive your new mattress you have 100 nights to decide if you are 100% comfortable. We recommend you have at least 10 nights sleeping on your new mattress before you consider an exchange. If you wish to make an exchange please consult with us so we can help make the best recommendation for you. Customers can pick up our products from our warehouse free of charge and in such cases will receive a $100 cash voucher. Dawn Latex Mattress offers Free Shipping Australia wide within 7 days, some very remote areas may take a little longer and incur additional costs. In these rare cases delivery will be free to the last depot before it becomes a remote area and the customer will be advised the costs of delivery for the remaining remote area. Dawn Latex Mattress will not except returns or refund purchases, however latex cores returned under our Free 100 Day Comfort Guarantee will be replaced free of charge, except where the conditions above apply for very remote areas. The Latex Mattress Cores must be returned in their original condition and undamaged. Take proper care of your new mattress during the 100 Day Comfort Guarantee period. A mattress core that has been damaged, altered or soiled in any way will void the comfort guarantee. If you decide to use our Comfort Guarantee you will need to consult with us first before attempting to package or return any Latex Mattress cores. To ensure that the Latex Mattress cores are protected during transport you should use similar to the original packaging. Your Latex Mattress cores can be exchanged for any of our Latex Mattress cores of equal or greater value. If the mattress core is of greater value, you will pay the difference. You can exchange your Latex Mattress cores only once during the 100 Day Comfort Guarantee period. We recommend our Latex Mattress Deluxe M2 only if you plan to combine the mattress with one of our support systems or bed frames. The best durability and comfort is provided with our quality 100% natural latex. 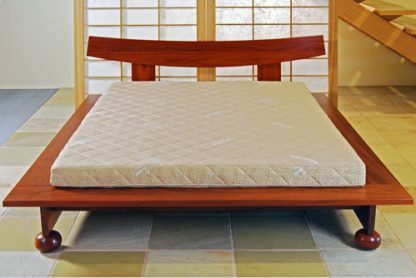 This 12cm thick latex mattress features our unique M2 firm/medium multi-density core. The density is tailored to suit your individual needs as well as your height, weight and sleeping preferences. Our latex mattresses can be created for couples who require different densities, each side of the mattress being tailored for each individual. To find out which mattress suits you best, please do our sleep system consultation. All of our latex mattress covers have 100% natural eucalyptus Tencel quilting which is covered with a heavy duty 100% cotton fabric. They can all be easily removed and washed at home.